NOTE: The PEC includes in its statistics murders among journalists, media employees, correspondents, freelances, cameramen, sound technicians, technicians, photographers, producers, media administrators and drivers. The figures do not register casualties among other media employees like guards, security staff. We do not include occasional media activists, bloggers, net-citizens. 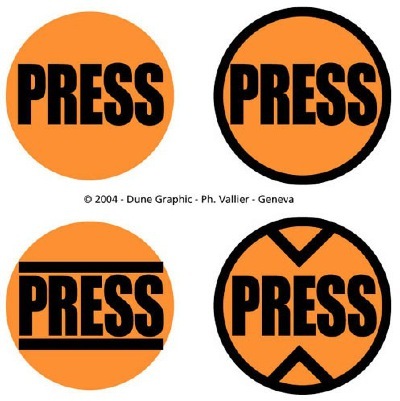 Sources are PEC members, news agencies, local media, national press associations, IFJ, UN, NGOs. The list of media workers' casualties is updated on a monthly basis since the first session of the UN Human Rights Council June 2006. We differentiate casualties between four categories: (T) for journalists intentionally targeted, (A) for journalists killed accidentally, i.e. in a terrorist blast or in cross-fire in fightings - private circumstances and road accidents are excluded - (C) for criminal causes (i.e. killed by drug traffickers) and (O) for other or unknown causes. The category changes when there are new findings. PEC figures are higher than those of other organizations beacause the PEC considers all media workers killed, wether it is work-related or not. It is, in fact, difficult to determine the causes of death and to prove that a crime is related or not to the work of the journalist, for accounts can vary highly depending on the sources, in the absence of independent and full investigations. SUMMARY for the first six months of 2018 (January to June): 66 journalists killed in 22 countries. 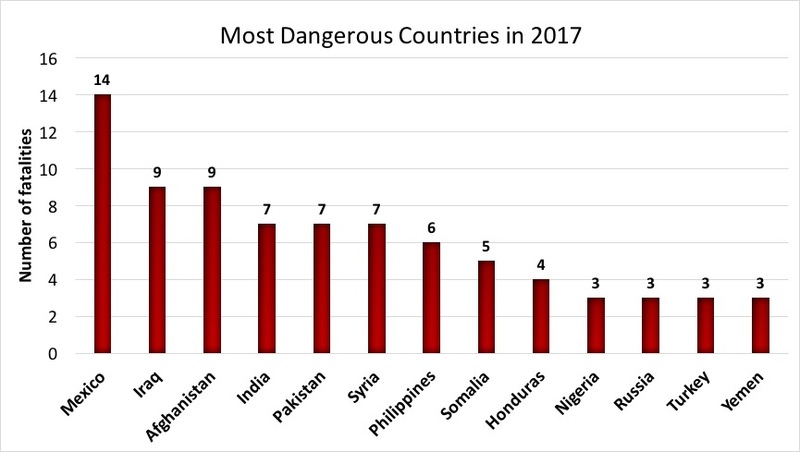 Afghanistan 11 killed, Mexico 8, Syria 7, United States of America 6, Yemen 5, India 4, Brazil 3, Ecuador 3, Philippines 3, Gaza (Israël) 2, Guatemala 2, Pakistan 2, Bangladesh 1, Colombia 1, Haiti 1, Indonesia 1, Irak 1, Liberia 1, Nicaragua 1, Russia 1, Salvador 1, Slovakia 1. SUMMARY FOR 2017: 99 JOURNALISTS KILLED IN 28 COUNTRIES: Mexico 14, Iraq 9, Afghanistan 9, India 7, Pakistan 7, Syria 7, Philippines 6, Somalia 5, Honduras 4, Nigeria 3, Russia 3, Turkey 3, Yemen 3, Colombia 2, Guatemala 2, Dominican Republic 2, Peru 2, Angola 1, Bangladesh 1, Brazil 1, Chile 1, Denmark 1, the Maldives 1, Malta 1, Myanmar 1, Papua New Guinea 1, Salvador 1, South Sudan 1. Summary for the first six months of 2017 (January to June) - 50 journalists killed in 18 countries: Mexico (9), Afghanistan (7), Iraq (6), Pakistan (5), Russia (3), Yemen (3), Dominican Republic (2), Guatemala (2), India (2), Peru (2), Philippines (2), Bangladesh (1), Burma (Myanmar 1), Honduras (1), Maldives (1), Nigeria (1), Syria (1) and Turkey (1). SUMMARY FOR 2016: 156 journalists killed in 33 countries (127 without the two plane crashes): Colombia 20 (in a plane crash), Iraq 16, Syria 14, Afghanistan 13, Mexico 12, Russia 12 (9 in a plane crash), Yemen 9, Guatemala 7, India 6, Pakistan 6, Turkey 5, Brazil 4, Libya 3, Somalia 3, Philippines 3, Finland 2, Kenya 2, Salvador 2, South Sudan 2, Ukraine 2, Algeria 1, Bahrain 1, Bangladesh 1, Burkina Faso 1, Democratic Republic of the Congo 1, Guinea 1, Honduras 1, Jordan 1, Myanmar 1, Peru 1, Serbia 1, United States 1, Venezuela 1. 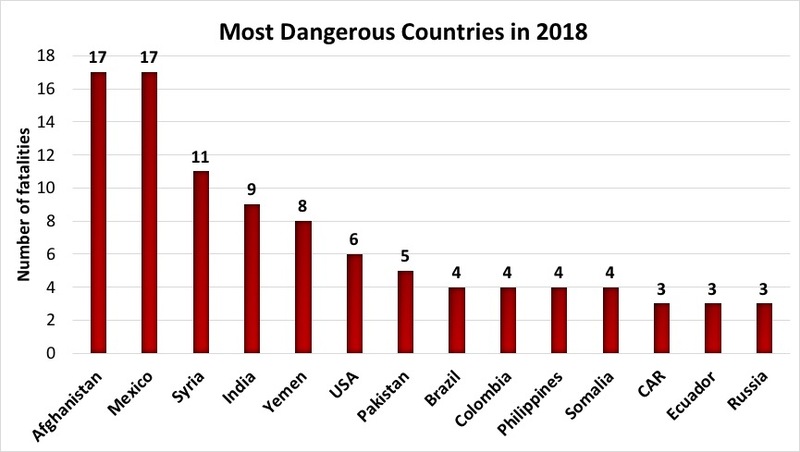 Without the 20 Brazilian journalists killed in the plane crash in Colombia and the 9 Russian journalists killed in the plane crash in the Black Sea, Irak stands as the most dangerous country with 16 killed, Syria : 14, Afghanistan : 13, Mexico : 12, Yemen : 9 and Guatemala 7. Another 6 journalists were killed in India as well as Pakistan, 5 in Turkey, 4 in Brazil, 3 in Libya, 3 in Russia, 3 in Somalia, 3 in the Philippines and 2 each in the following countries : Finland, Kenya, Salvador, South Sudan and Ukraine, then one journalist in each of the following countries : Algeria, Bahrain, Bangladesh, Burkina Faso, Democratic Republic of the Congo, Guinea, Honduras, Jordan, Myanmar, Peru, Serbia, United States, and Venezuela. During the five-year period 2012 to 2016 the war in Syria resulted in the killing of more than 100 journalists. 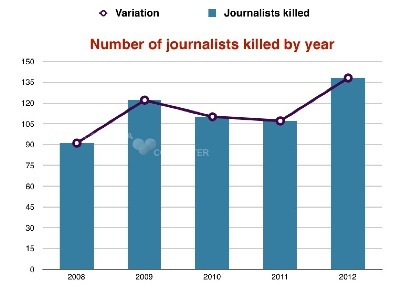 The most dangerous country for media work after Syria during the same period is Irak with 55 journalists killed. Pakistan follows with 50 killed mostly in the tribal areas close to the borders with Afghanistan. 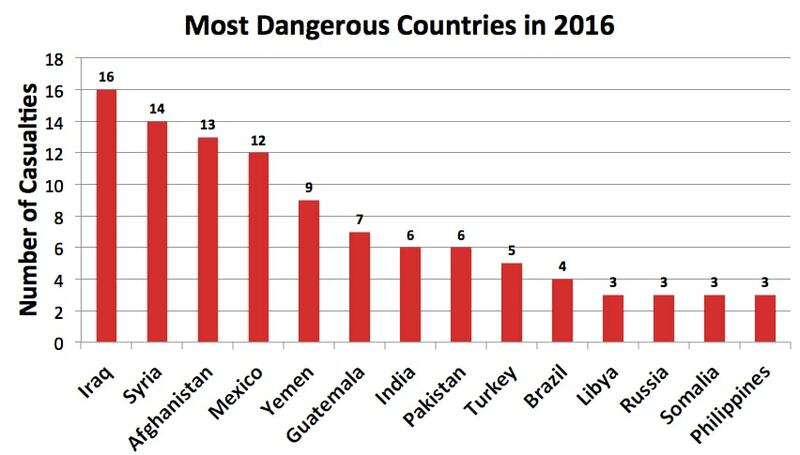 Mexico follows : 46, Somalia : 41, Brazil : 34, Phillipines : 31, India : 28, Afghanistan : 27, Honduras : 21 among the ten most dangerous countries. 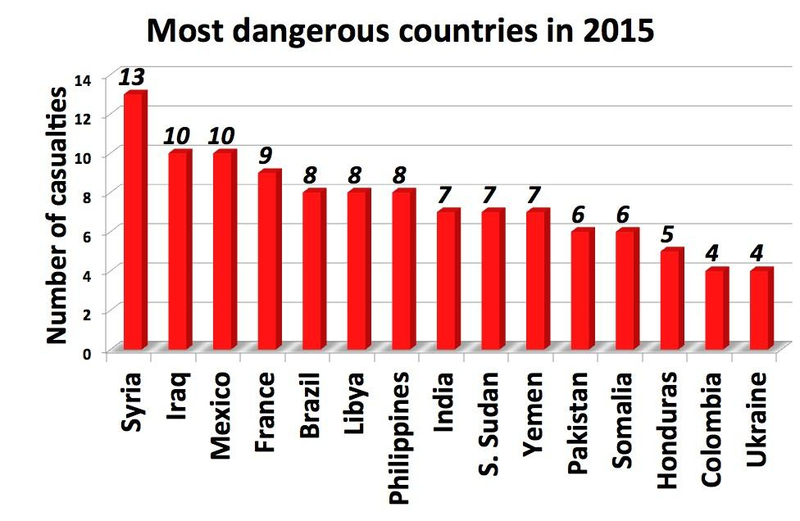 Without the plane crashes in Colombia and the Black Sea, the Middle East and North Africa heads the most dangerous regions with 45 killed in 2016 (35,4%), Asia came second with 30 journalists killed (23,6%), then Latin America (28 killed, 22%), Europe with 13 killed (10,2%), Africa 10 (7,9%), one journalist was killed in North America (0,8%). Summary for the first six months of 2016 (January to June) - 74 journalists killed in 22 countries: Afghanistan (10 killed), Syria (9), Mexico (8), Iraq (7), Yemen (7), Guatemala (5), India (4), Pakistan (4), Turkey (4), Philippines (2), Russia (2), Salvador (2), Bangladesh (1), Brazil (1), Burkina Faso (1), Guinea (1), Honduras (1), Libya (1), Serbia (1), United States (1), Somalia (1) and Venezuela (1). SUMMARY FOR 2015: 135 journalists killed in 33 countries: Syria 13 killed, Iraq 10, Mexico 10, France 9, Brazil 8, Libya 8, the Philippines 8, India 7, South Sudan 7, Yemen 7, Pakistan 6, Somalia 6, Honduras 5, Colombia 4, Ukraine 4, Bangladesh 3, Guatemala 3, Afghanistan 2, USA 2. 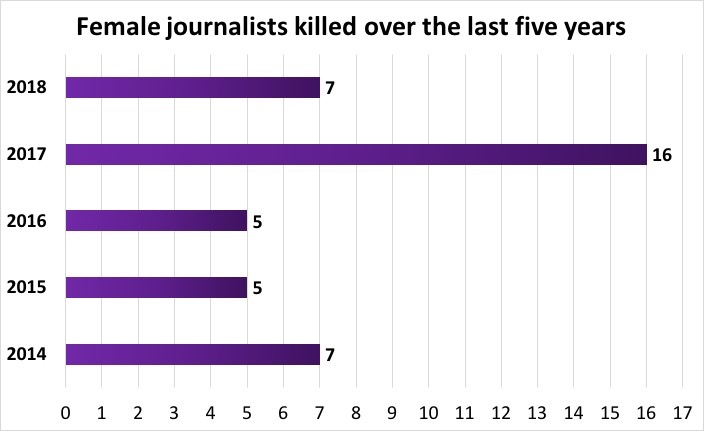 One journalist was killed in each of the following countries: Azerbaijan, Burundi, Dominican Republic, the Democratic Republic of the Congo, Gaza (OPT), Ghana, Indonesia, Kenya, Mali, Mozambique, Paraguay, Poland, Saudi Arabia. 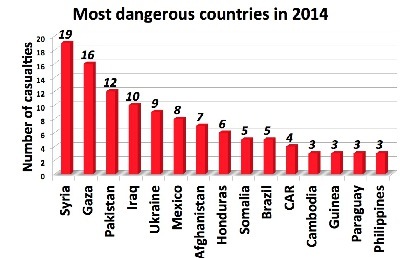 Two thirds of the victims were killed in ten countries this year. The most dangerous country was Syria with 13 journalists killed, followed by Iraq and Mexico where ten journalists were killed in each country. Nine journalists were killed in France and eight in Brazil, Libya and the Philippines. Seven journalists were killed in each of the following countries: India, South Sudan and Yemen. Pakistan and Somalia rank 11th with 6 journalists killed, followed by Honduras 5, Colombia 4, Ukraine 4, Guatemala 3, Afghanistan 2, USA 2. 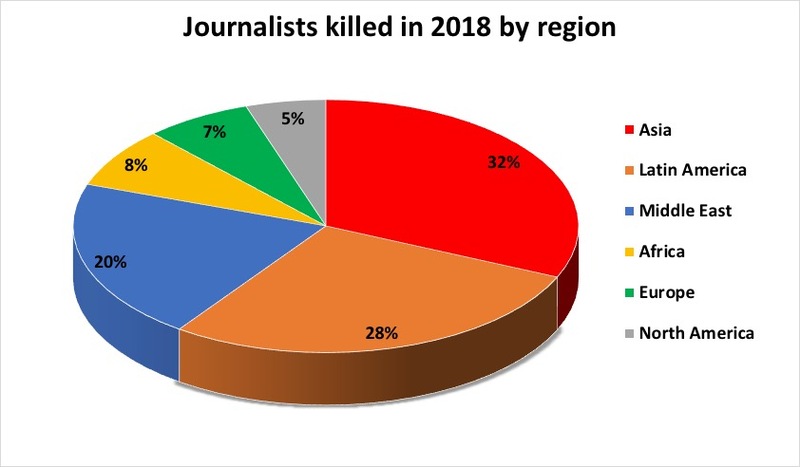 One journalist was killed in each of the following countries: Azerbaijan, Bangladesh, Burundi, Dominican Republic, the Democratic Republic of the Congo, Gaza (OPT), Ghana, Indonesia, Kenya, Mali, Mozambique, Paraguay, Poland, Saudi Arabia. The Middle East remains the most risky region with 40 journalists killed, followed by Latin America 32 killed, Asia 28, Africa 19, Europe 14. Two American journalists were killed live on air in the USA. More than half the victims were killed in countries at war, according to the PEC record. Around 50 were killed by non-state actors, terrorist groups or by organized criminal groups in Iraq, Syria, France, Libya, Somalia, Yemen and Mexico. 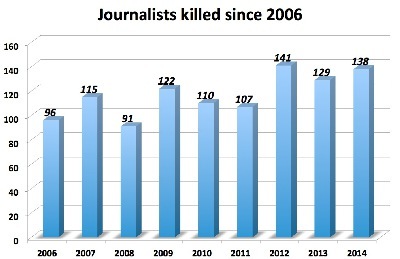 Some 88 journalists were killed in Syria alone during the past five years. Pakistan follows Syria with 55 killed, then Irak with 46 journalists killed and Mexico the same 46. 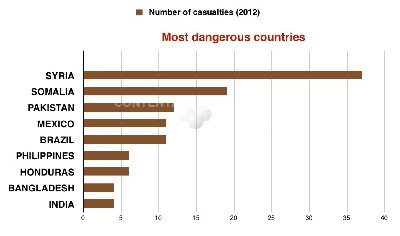 Somalia ranks 5th with 42 killed, then Brazil 36 and the Philippines 34. Honduras comes next (26), then India (25) and Libya (20). 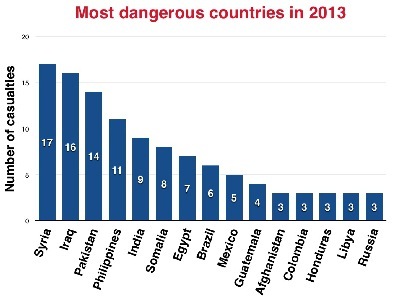 These ten countries account for two thirds of the total death toll since 2011 (418 of 646). 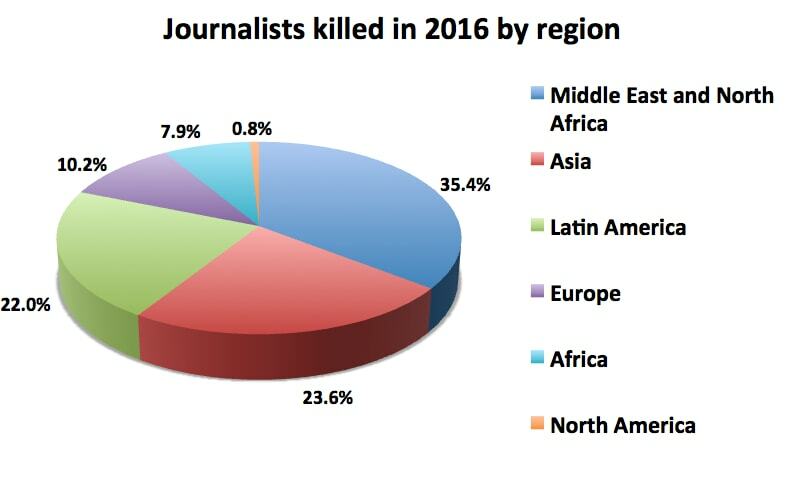 Summary for the first six months of 2015 (January to June) - 71 journalists killed in 24 countries: France (8 killed), Libya (8), Irak (6), South Sudan (6), Yemen (6), Mexico (4), Ukraine (4), Brazil (3), Honduras (3), Guatemala (3), Philippines (3), Colombia (2), India (2), Pakistan (2), Syria (2), Afghanistan (1), Democratic Republic of the Congo (1), Dominican Republic (1), Gaza (1), Indonesia (1), Kenya (1), Paraguay (1), Poland (1) and Somalia (1). Syria leads the list, with 19 journalists killed, followed by Gaza with 16 journalists killed by Israel during the Operation Protective Edge, and Pakistan (12 killed). Iraq comes in fourth place among the most dangerous places for media work, with 10 journalists killed. 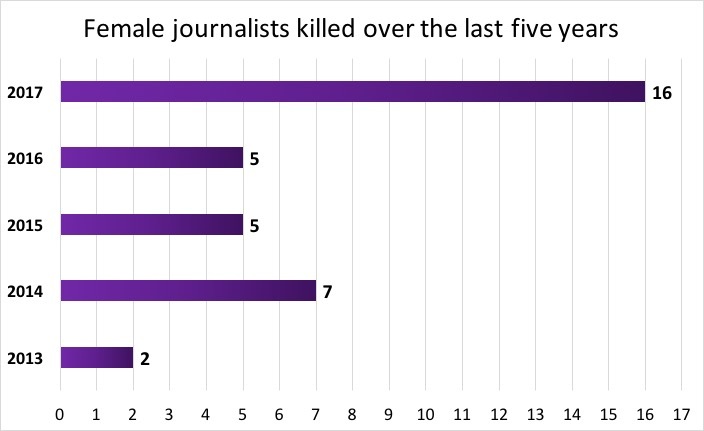 Ukraine takes fifth place, with 9 journalists killed. 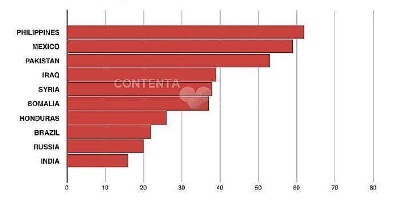 Mexico ranks 6th with 8 journalists killed; followed by Afghanistan with 7 killed; then Honduras, with 6 killed; and Somalia and Brazil with 5 in each country. The Central African Republic hold the tenth position with 4 journalists killed. Three journalists were killed in the following countries: Cambodia, Guinea (during a media mission covering the Ebola outbreak), Paraguay and the Philippines. 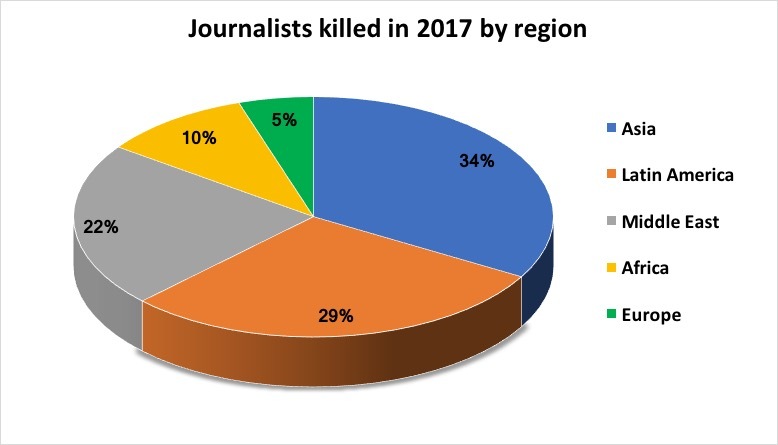 Two journalists were killed in the following countries: Bangladesh, Colombia, Democratic Republic of the Congo (DRC), India, Libya, Peru, Turkey and Yemen. One journalist was killed in each of these countries: Burma, Dominican Republic, Egypt, Lebanon, Nigeria, Panama, Russia, Salvador, and Saudi Arabia. 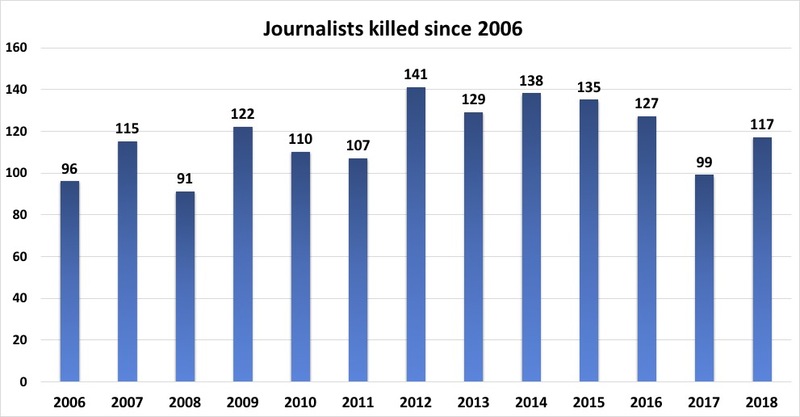 During the past five years (2010 to 2014), the figure stands at a total of 625 journalists killed, which is an average of 125 annually, or 2.4 per week. 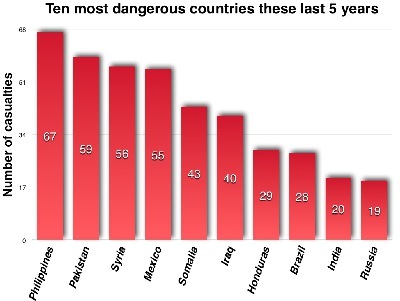 The most dangerous five countries during the past five years have been Syria, 75 journalists killed; Pakistan 63; Mexico 50; Iraq 44; and Somalia 39. Then comes Brazil, 32 killed; Honduras, 31 killed; Philippines, 29 killed; India 21; and the Occupied Palestinian Territory (OPT) 21. The figure for the past nine years during which the PEC has been keeping track, stands at more than 1000 journalists (1048, to be precise). 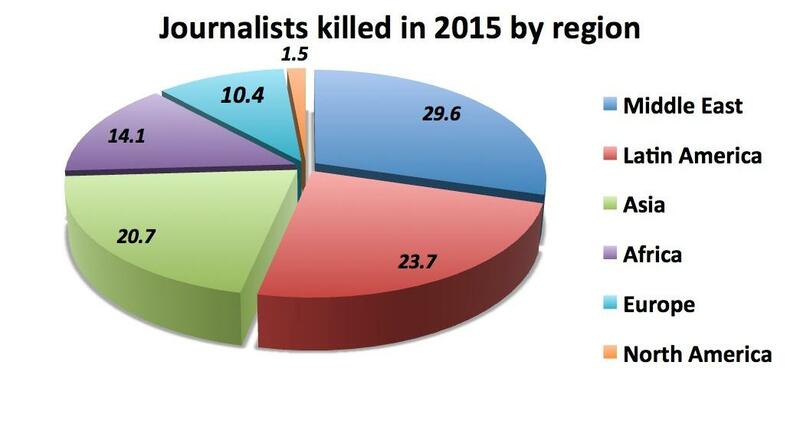 SUMMARY FOR 2014 - 138 journalists killed in 32 countries: Syria (19), Gaza/Israël (16), Pakistan (12), Iraq (10), Ukraine (9), Mexico (8), Afghanistan (7), Honduras (6), Somalia (5), Brazil (5), Central Africain Republic (4), Cambodia (3), Guinea (3), Paraguay (3), Philippines (3), Bangladesh (2), Colombia (2), India (2), Libya (2), Peru (2), Turkey (2), Yemen (2), Democratic Republic of the Congo (2), Burma (1), Dominican Republic (1), Egypt (1), Lebanon (1), Nigeria (1), Panama (1), Russia (1), Salvador (1), Saudi Arabia (1). Summary for the first six months of 2014 (January to June) - 66 journalists killed in 22 countries: Syria (11), Iraq (7), Ukraine (7), Afghanistan (4), Brazil (4), Central African Republic (4), Pakistan (4), Mexico (3), Philippines (3), Honduras (3), Cambodia (2), Libya (2), Paraguay (2), Somalia (2), Bangladesh (1), Colombia (1), Democratic Republic of the Congo (DRC) (1), Egypt (1), India (1), Lebanon (1), Panama (1), Saudi Arabia (1). 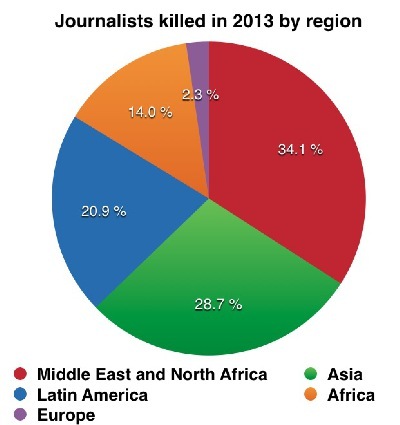 Summary for 2013: 129 journalists killed: Syria (17), Iraq (16), Pakistan (14), Philippines (11), India (9), Somalia (8), Egypt (7), Brazil (6), Mexico (5), Guatemala (4), Afghanistan (3), Colombia (3), Honduras (3), Libya (3), Russia (3), Haiti (2), Kenya (2), Mali (2), Paraguay (2), Central African Republic (1), Democratic Republic of the Congo (1), Ecuador (1), Ivory Coast (1), Nigeria (1), Peru (1), Tanzania (1), Uganda (1), Yemen (1). Summary for the first six months of 2013 (January to June) - 59 journalists killed in 23 countries: Pakistan (10), Syria (8), Somalia (5), Brazil (5), India (4), Afghanistan (3), Guatemala (2), Haiti (2), Iraq (2), Mexico (2), Paraguay (2), Philippines (2), Russia (2), Central African Republic (1), Ecuador (1), Egypt (1)Kenya (1), Nigeria (1), Uganda (1), Peru (1), Democratic Republic of Congo (1), Tanzania (1) and Yemen (1). 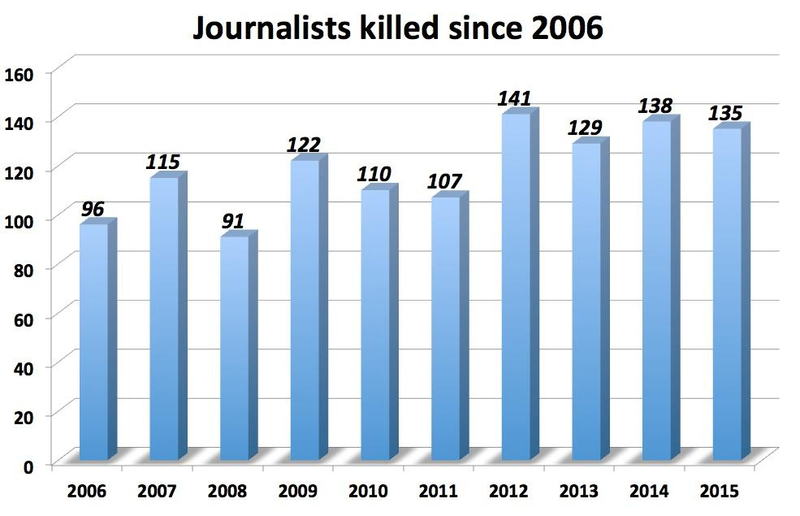 Summary for 2012: 141 journalists killed - Syria 37 journalists killed, Somalia 19, Pakistan 12, Brazil 11, Mexico 11, Honduras 6, Philippines 6, Bangladesh 4, India 4, Erithrea 3, Israel/Gaza 3, Iraq 3, Nigeria 3, Afghanistan 2, Bolivia 2, Colombia 2, Bahrain 1, Cambodia 1, Ecuador 1, Egypt 1, Haiti 1, Indonesia 1, Nepal 1, Panama 1, Russia 1, South Sudan 1, Tanzania 1, Thailand 1, and Uganda 1. 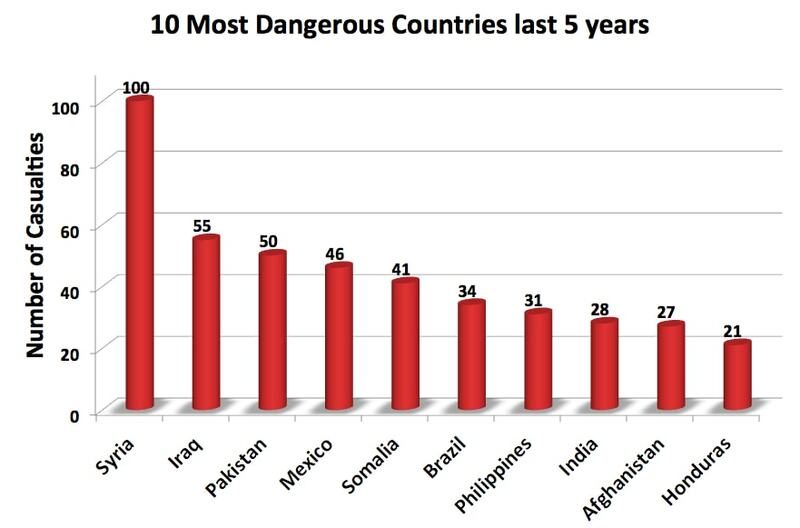 Casualties 2008-2012, most dangerous countries: Philippines 62, Mexico 59, Pakistan 53, Iraq 39, Syria 39, Somalia 37, Honduras 26, Brazil 22, Russia 20, India 17. 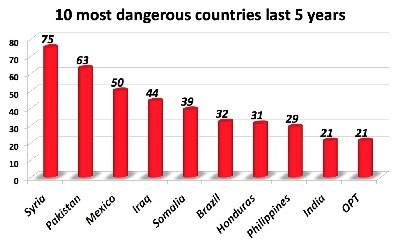 Most dangerous countries 2012: Syria 37 journalists killed, Somalia 19, Pakistan 12, Mexico 11, Brazil 11, Philippines 6, Honduras 6, Bangladesh 4 and India 4. Summary for 2011 - 107 journalists killed: Mexico (12), Pakistan (11), Iraq (7), Libya (7), Philippines (6), Brazil (6), Honduras (6), Yemen (5), Somalia (4), Afghanistan (3), Egypt (3), India (3), Peru (3), Russia (3), Bahrain (2), Thailand (2), Syria (2), Algeria (1), Azerbaijan (1), Bolivia (1), China (1), Colombia (1), Ivory Coast (1), Gaza (OPT) (1), Guatemala (1), Haiti (1), Nepal (1), New Zealand (1), Nigeria (1), Uganda (1), Panama (1), Democratic Republic of the Congo (DRC) (1), Dominican Republic (1), El Salvador (1), Sierra Leone (1), Tunisia (1), Ukraine (1), Venezuela (1), and Vietnam (1). 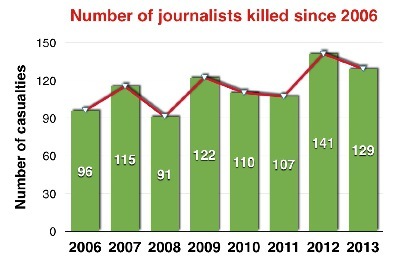 Summary for 2010: 110 journalists killed: Mexico 14, Pakistan 14, Honduras 10, Iraq 8, Philippines 6, Russia 5, Colombia 4, Brazil 4, Nigeria 5, Indonesia 4, Somalia 3, Nepal 3, Afghanistan 2, Angola 2, Thailand 2, India 3, Venezuela 2, Uganda 2, Argentina 1, Bangladesh 1, Belarus 1, Bulgaria 1, Cameroun 1, Cyprus 1, Ecuador 1, Greece 1, Guatemala 1, Israel (Gaza) 1, Lebanon 1, the Democratic Republic of the Congo (DRC) 1, Rwanda 1, Turkey 1, Ukraine 1, China 1 and Yemen 1.